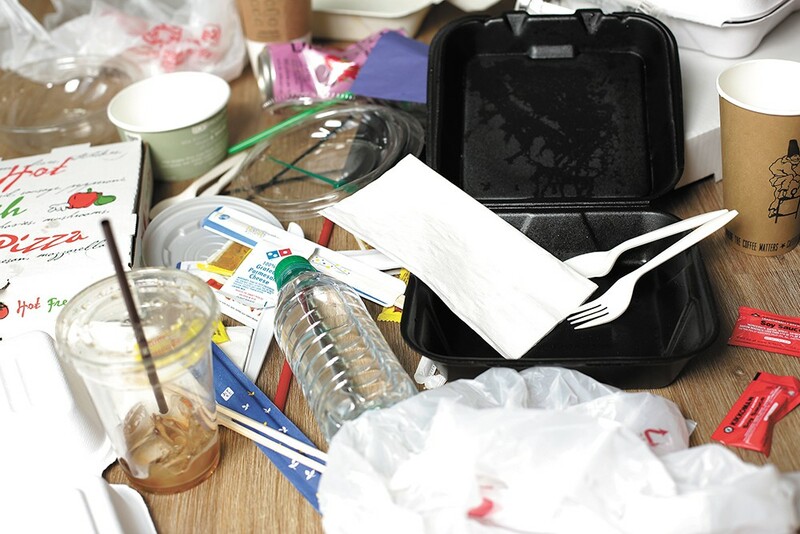 How much waste does the average restaurant in Spokane produce each day, week or even year? While the numbers are incredibly hard to pin down due to the practices of each individual restaurant, its format (fast food vs. dine in), location, customer volume and a multitude of other factors, the answer is: a lot. But it doesn't have to be that way. At Cochinito Taqueria in downtown Spokane, for example, there's just one receptacle for waste. It's a compost bin. "Visiting Cochinito is a great way to think about designing a system so it doesn't become more cumbersome," says Erik Makinson, founder and CEO of Resource Synergy. The Spokane-based company works with businesses of varying scale, and not just restaurants, to help them reduce money spent on water, energy and waste disposal, thus becoming more environmentally sustainable in the process. "They've designed out trash from the front of their house — they just don't have trash generated in the dining area," he continues. "There is still some packaging in the kitchen, but that is a great example of starting with the end in mind." The fast-casual taco eatery serves its food on metal trays lined with paper, and traditional stainless steel utensils and other reusable items are collected in a dish bin at a self-bus station. Most of its beer selection is in recyclable cans. Other drinks are served in glasses with compostable straws. Cochinito chef and co-owner Travis Dickinson says there were a few reasons to compost nearly all his restaurant's waste. First and foremost, the building in which it's located was at capacity for its trash collection when he moved in, meaning Cochinito would have to pay significantly more for garbage service, or figure out another solution. Dickinson personally believes in operating the restaurant as sustainably as possible and saw composting as a practical means to do so. "Rather than filling up a dumpster, we have a 90-gallon compost bin that we dump three times a week," Dickinson says. "We've been able to keep it to 80 percent going into compost and recycling with just a small amount of garbage." As an industry, restaurants are one of the biggest consumers of water and energy, and one of the largest commercial waste producers, Makinson says. "The challenge with restaurants is that it has less to do with the size, but how much traffic and business they have coming through," he explains. "Likewise, the mix of the waste would change dramatically based on the type, but in full-service [restaurants] we look at food and cardboard... if they are a fast food/quick serve, there are packaging opportunities in preventing waste from happening." It may be hard from a consumer perspective to envision all the behind-the-scenes practices that contribute to this overall waste-stream picture — there's food scraps, packaging, used cooking oil and grease, items used for sanitation (latex gloves, paper towels, etc.) and lots more that factors in. A couple ways of looking at it, however, can be seen in what types of single-use consumer items — napkins, utensils, straws, to-go containers, cups, packaging, etc. — are being used, like at Cochinito, and how waste is collected in the front of house; whether or not in separate bins for compostable and recyclable materials, or neither. Composting food waste and other single-use items made with biodegradable materials, like paper napkins and corn starch-based utensils, requires more effort on behalf of both business owners and consumers, making it a practice that not all locally owned restaurants find feasible. Compostable containers on average can cost twice as much as those made with traditional plastics or plastic foam (what most of us call Styrofoam), the latter of which cannot be recycled. Compost that's been contaminated with plastic and other nonbiodegradable materials is also a major issue that arises, due both to ignorance and accident. In the city of Spokane, compostable items can be disposed of in residential green yard waste carts, even soiled cardboard like pizza boxes. City-provided green carts, however, are only picked up nine months of the year, from March through November, and are offered for an additional fee to regular waste/recycling pickup. Though these residential green bins can also be used by businesses, the city of Spokane technically doesn't offer year-round, commercial compost pickup, a detail that can be frustrating for small businesses already paying for city solid waste services that would like to compost some of that waste. Roast House Coffee owner Deborah Di Bernardo, who recently opened First Avenue Coffee downtown, is one of the business owners frustrated over the lack of city-provided commercial composting. She and a few of her staff currently take the store's coffee grounds and other compostable waste home to dispose of in their own green bins. They also hand-sort their in-store compost and recycle bins to pick out contaminants incorrectly tossed there by customers. "It sounds kind of disgusting, but nonetheless we go through them anyway to some degree because people don't pay attention," Di Bernardo says. "I think a lot of customers appreciate it and are careful, but there are always one or two who [don't]." First Avenue Coffee recently received Green Restaurant Certification, a designation overseen by the Green Restaurant Association, and hopes to become a zero-waste producing business in the near future. All of its to-go containers are compostable or recyclable, and customers who bring their own mug get a 25 cent discount. As demand from residential customers for green cart service has anecdotally increased in recent years, there's also been talk at the city about adding commercial compost routes, says Kris Major, education coordinator for the City of Spokane's Solid Waste Services Department. She adds that a timeline for such services is unknown. "We're getting more and more calls all the time, even 'Can you come in and help train our staff and tell them what is recyclable and what's not so we don't make mistakes?'" Major notes. In the meantime, restaurants producing large amounts of compostable waste like Cochinito can work with a private disposal company to pick up their compost. There are two main options locally: Sunshine Disposal and Waste Management. Compostable waste is then processed by Barr-Tech, which sells its soil products through local landscape companies and directly to regional farmers. The buzz around disposable, single-use food service items has slowed down some since the announcement earlier this year that Seattle was banning plastic straws, utensils and other nonrecyclable and noncompostable packaging. But the question of how to reduce waste from single-use products remains constant in cities around the world. Will we see Spokane follow in Seattle's steps? Maybe, but not for awhile. It is a topic on the mind of some City Council members, including Councilman Breean Beggs, who's been approached by constituents concerned about curbing single-use waste in our local ecosystem. "We have discussed it a bit in regards to the waste-to-energy plant, and how to minimize the diversion of plastics into the burning waste stream, so my sense is that there is some discussion on it, but no concrete proposals," Beggs says. He adds that issues connected to food-related waste are most likely be taken up by the city's newly created Sustainability Action Committee. "I think the answer is to reduce those items in the waste stream, but the question is always how best to do it, and how to be most effective and how to get buy-in from the community," he says. Even while official actions by the city of Spokane on commercial composting and banning single-use items are uncertain, many food service businesses across the region have been outspoken about taking matters into their own hands. Announcements on social media that plastic straws would only be available upon request at many local restaurants and bars were plentiful following Seattle's controversial straw ban. Consumers can take a stance, too, says Resource Synergy's Makinson, by voting with their dollar. The original print version of this article was headlined "Waste Not"